Join us for the first show in our Summer Concert Series! 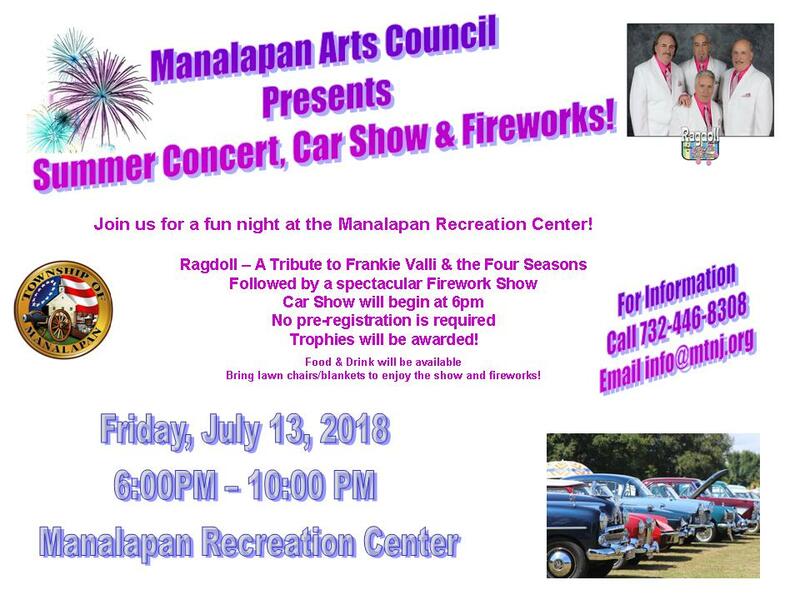 The Township Committee and the Manalapan Township Arts Council will be hosting a fun night at the Manalapan Recreation Center on Friday, July 13th beginning at 6pm! CAR SHOW! The car show will begin in our West Entrance Parking Lot. Bring Your Car! No pre-registration is required. Prizes will be awarded and plaques given to all participants. CONCERT! Ragdoll will play at 8pm. Ragdoll has wowed audiences all over the country with their explosive sound and entertaining show - playing the very best of Frankie Valli & The Four Seasons! Food and drink will be available. Bring chairs/blankets to sit and enjoy the show. Save the date for our next concert – August 17th – Beetlemania Again!